How utterly AMAZING was the weather over the weekend?! I can't quite believe it's been as warm as it has but I'm so thankful it's finally decided to feel like summer. I had a seriously fun weekend - spent Saturday on the beach and then at night had a big family BBQ, whilst Sunday was spent enjoying the sunshine with my boyfriend and I had a really nice time. I am looking forward to the next few weeks of sunshine, as it's set to stick around! This outfit is actually something I wore a few weekends back. 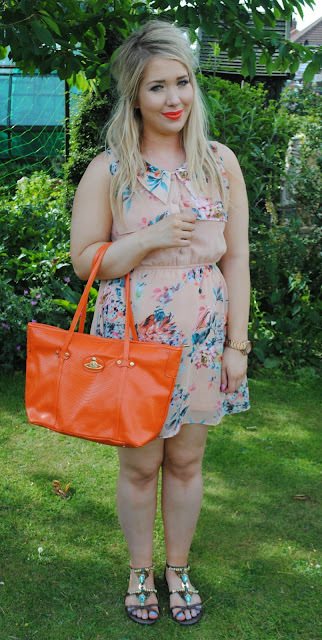 I was recently sent this dress from She Likes and it's so beautiful; it's the perfect combination of things I love - statement collar, floral, and a gorgeous pastel orange colour. 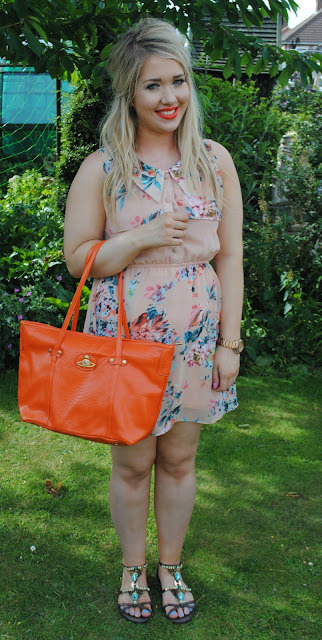 I paired it with my favourite River Island sandals and my Vivienne-alike bag from Ebay. I ordered this a few weeks ago for just over a tenner and I absolutely love it. Okay, so I don't actually think Vivienne Westwood do a bag like this but still, it has the orb logo and is pretty decent quality for the price. It's also a really good size and they do it in four colours. Love! I'm getting used to having a full-time job again and blogging so I apologise if posts aren't always as regular as I'd like them to be! I'm working out my time management and organisation to make sure I can get back to posting everyday, as I absolutely love doing it. It's just so difficult as I've also been going to the gym most nights so it's a case of finding the time! I'm sure I'll get the hang of it soon though! I hope everyone has been enjoying the lovely sunshine and had a great weekend!